I’ve said it before, and I’ll say it again: The children are our future. You can learn a lot about the future by watching them, particularly by watching how they use technology and how they consume media, and how that will translate into future business models. Take newspapers, for instance: Somewhere along the line the younger generation stopped reading newspapers, opting instead to get their news online. (This idea seems quaint, now, for those of us who make our livings writing for web-only publications.) Or take my generation, which somewhere along the line decided that it didn’t want land lines — who wants a phone that only rings in a place you’re rarely at?!?! — and went mobile-first, and in most cases, mobile-only. 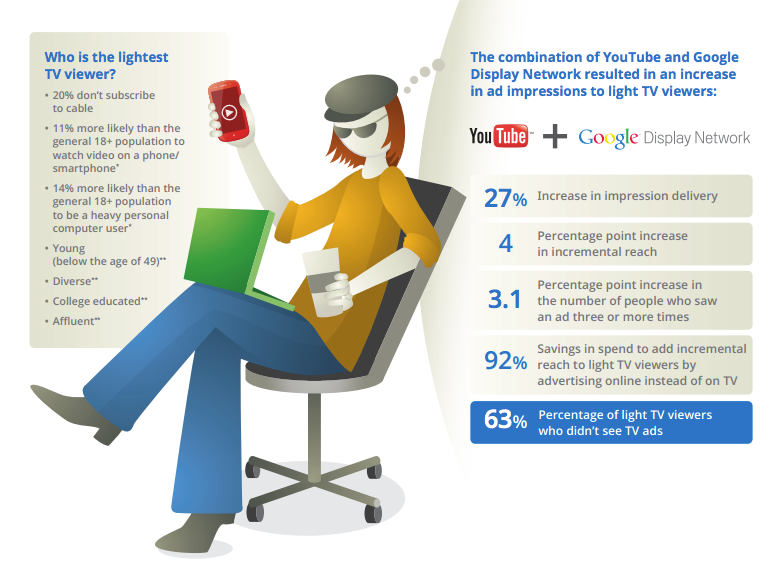 I thought about this trend when I saw a study YouTube did with Nielsen, seeking more information about the elusive “light TV viewers.” So what do we know about them? They’re generally younger — under 49 years old — and they tend to be well-off, college-educated, and highly influential due to their interest in social networking. In other words, they’re a highly coveted demographic among marketers. These aren’t the people who just sit in front of a TV for five hours every day. In fact, they average only about 39 minutes of TV viewing a day, according to the study. But it’s not like they’re great outdoorsmen. Instead, they are finding their entertainment elsewhere — online, on mobile devices, on social networks, etc. YouTube’s goal was to help advertisers better understand and target messages to this strange beast. The cross-media study with Nielsen looked at how effective ads were across TV, YouTube, and the Google Display Network. (GDN) And not surprisingly, the study found that advertisers can better reach kids who don’t really watch TV by also putting their ads on YouTube and GDN. Here are the stats to back those claims up: According to YouTube (and Nielsen), campaigns that included YouTube and GDN added four percentage points of incremental reach to light TV viewers. More importantly, it cost 92 percent less to achieve those results online versus on TV. The study also found that putting ads only on TV didn’t reach some 63 percent of light TV viewers — because duh, they don’t watch TV. But for me, the most interesting thing about this research around the “light TV” segment is that it’s growing, with the number of households opting for broadband Internet over cable TV increasing 22.8 percent over the past year. Granted, that’s 22.8 percent over a very small number, but it’s a much bigger percentage than the increase in the number of people who signed up for cable last year. The point is that, just like the kids who stopped reading newspapers or paying for landlines, we can probably expect this young generation of people who aren’t really that into TV to continue to not really be that into TV. And if that happens, the $100 billion TV advertising industry will need to find other ways of reaching that audience. As seen in the study, YouTube will be one of those channels, and an important one — but frankly, not the only one. We can expect to see TV ad spending shift to multiple new outlets as time goes on and marketers seek to reach an ever-growing number of viewers who are on their mobile phones, tablets, and PCs instead of watching TV.